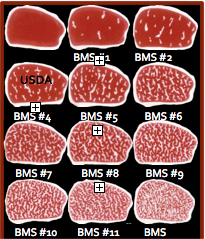 Thompson River Ranch, the wagyu beef supplier for FIT describes the “Wagyu Legend”..
has 12 levels, 7 are above the USDA Prime (see above). Our cattle routinely grade at the Japanese level of BMS 7-8. quality comes from meticulous attention to detail and a commitment to premier genetics and healthy nutrition. We are committed to offering Wagyu beef that is 75-100% Wagyu genetics, which is quite different than virtually all the Wagyu beef in America today. We feel strongly about our program and hope that you value our commitment to producing sustainable, healthy, tasty and tender beef. Wagyu, or “Kobe Beef” as marketed by many, is a specific breed originating from Japan. Wagyu is a breed of cow, just as Angus is the predominant breed in the USA. “Kobe” is a location in Japan where cows are raised, comparable to Texas or Montana. Historically, the Kobe region in Japan produced very high-quality Wagyu cows. “Kobe Beef” is a catchy marketing term used by many US meat marketers. We believe that it is more appropriate to call the cattle “American Wagyu”. Wagyu cattle are a genetically unique breed. These animals are more ox-like in structure and are built for endurance. As a result, the marbling occurs in the muscle of the animal rather than on the perimeter of the muscle. In the early 90’s, as a result of a new trade agreement, a herd of ~40 full blood Wagyu cows and bulls were brought into the US. Since that time, just a few ranches have been active in producing this outstanding breed. Even today there are limited numbers of 100% Wagyu animals in the United States, numbering only a few thousand. The majority of the Wagyu or “Kobe” meat sold in the US is a 50/50 cross between a Wagyu and an Angus. Wagyu contributes its intense marbling, Angus contributes size and growth, resulting in meat that is a significant improvement over 100% Angus. After testing a variety of genetic crosses specifically for beef consumption, we believe a 50/50 cross breed animal does not showcase the best traits of Wagyu. A higher percentage of Wagyu genetics is needed to achieve the renowned marbling and taste of these animals. Thompson River Ranch is one of the top American ranches producing 75-100% American Wagyu cattle. Our concept of nutrition is pretty simple – a healthy, well-fed animal produces healthy beef. Our program consists of grass-fed animals through the first 12-months and then switching to a nutritious diet still consisting primarily of grass, supplemented by other natural ingredients (hay, distiller’s and other grains), focused on slow growth through the age of 30-36 months. Our animal’s weight gain is designed to be 1.75 lbs/day for 500 days. The result is an animal that naturally matures, another aspect of producing delicious meat. Beef is an excellent source of protein and vitamins B-6 and B-12. The largest health concern for beef is the type and amounts of fat and any additives. With our beef, we never use hormones nor feed antibiotics. Additionally, studies have been done quantifying the advantages of feeding cattle a high percentage hay diet over a long period of time. The data is pretty amazing relative to the type of fat produced. The human body can manufacture most of the fat types it wants, except for essential fatty acids (EFA’s). Most positive health benefits are seen in two types of EFAs – linoleic acid (omega 6) and linolenic acid (omega 3). Wagyu beef is an excellent source of both of these EFAs. Another unique advantage in Wagyu is that it contains a much higher proportion of the desirable fats (mono) than other beef. The Mono-Unsaturated Fatty Acids to Saturated Fatty Acids ratio (MUFA:SFA) is up to three times higher, 6:1, in Wagyu than in any other beef (normal ratio is about 2:1). Consuming Wagyu beef is beneficial to your health, possessing a unique high concentration of beneficial omega 3 and omega 6 fatty acids and a higher ratio of mono to saturated fats. The health/fat benefits come from: 1) The Wagyu breed – more ox-like, endurance animal that genetically is more marbled than other cattle breeds; 2) The lower-caloric, long-feed program-producing a 1400-1500 lb. animal over 30-36 months; and 3) The type/ratio of feed – grass, roughage and grain – lower in calories and higher in the EFA’s that represent healthy fats. We hope that you can tell we are proud of our American Wagyu Program. Our commitment to provide sustainable, healthy, tasty and tender beef is unwavering. Our hope is that you are as passionate in discovering products that matter in your family’s health and in sustaining the earth’s resources. We feel confident that if these things matter to you, then Thompson River Ranch high-percentage, long-fed American Wagyu is the right product for you.